It's vacation time again, and that means tractoring through at least three books in a week. 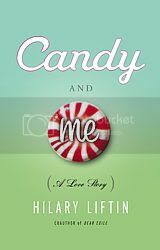 I started off with a real gem- Candy and Me: A Love Story, by Hilary Liftin. So, with vh1's 40 Most Awesomely Bad Songs...Ever playing in the background, I write my first book review for bibliotalk. This memoir, with chapters named after Liftin's favorite sweets, will please anyone with an innocent little obsession. Her tastes change as she experiences intellectual, spiritual and sexual growth, but my favorite aspect of this book was her long and faithful relationship with sugar. This book is quirky, with chapters on her religious youth and her purposelesness as a college student mixed in with one-sentence chapters devoted to Trix. While this book is a easy to breeze through in a day, it is by no means forgettable. Young adults can relate to Hilary's experiences on a somewhat deep level, and the novelty of the book is overshadowed by the well-written stories and aching honesty. So, what obsession of yours do you wish someone would write a book about? This is not about a particular book- I'll delete it straight away if it is not wanted because of this! A lot of people have opinions on artists and "selling out", or (roughly) recieving money for mainstream media that is not within the artists' expertise . What is your opinion on authors selling out? I was recently crushed to discover that Francesca Lia Block, my favorite author alive today, was developing a series for MTV and a cinema version of Weetzie Bat. Perhaps that is because Meg Cabot (author of my former guilty pleasure, The Princess Diaries series) made two movies that beared no resemblance to the books that they were based on, then started churning out books that would appeal to the masses and not the loyal readers that she had before the movie contract. Or is it because deep down, we all wish that popular books were really our own? Anyone who's read Siddalee's library experience in Little Altars Everywhere understands what I'm talking about! Perhaps I'm just being elitist. I know what kinds of shows are on MTV, and I don't want people tuning in to watch Direct Effect just to half-heartedly enjoy the stories that I've loved so much. But enough with all of my opinions! I want to know what you guys think. Well, this is probably the best lesson I've ever had on not judging a book by its cover, or even by its summary! I kept reading all these reviews about how great this book was, but all the summaries were saying things like, "Daisy goes off and lives in the countryside of England with her cousins to escape the war." Which I jumped to the conclusion that it was WWII, making this historical fiction, which is generally not my bag. Anyway, I was wrong about that and when the book won the Michael J. Printz award, I decided to check it out. Turns out that it is about a modern fictional war, and the way it handles the war and the way the war plays out and is part of the book is really particularly interesting, given the way the nature of war has changed but we really haven't been first hand witnesses to that in any long drawn out sense. Of course, a big thing in this book is Daisy and Edmond being in love. In a lot of cultures, it is actually a desirable thing for cousins to marry because they want to keep the wealth or land of a family together. It is really only in western society that it is such a taboo. Having said that, it definitely skeeved me out, just like it skeeved them out. But then they go through so much. Seeing people's faces blown off, surviving starvation, becoming un-anorexic, being afraid for so long. I think it just puts everything in perspective. Like, is being in love with your cousin really that bad in comparison to everything else you have seen and survived, and everything else that continues to go on in a war-stricken world? I don't know the answer to that, I guess, but I do know that by the end of the book I was no longer upset by it, in fact I was really happy when Daisy and Edmond could get back together. So it's a real question, are our values and morals only relative? Like, under certain circumstances, is anything ok?